When her 23-year-old sister, Yukari, refuses to go to an arranged marriage meeting, 16-year-old Hana Nonomura takes meeting with 26-year-old Takane Saibara, the heir to a vast business fortune. Hana and Yukari's father works for the company owned by Takane's family, and he feared that Yukari's refusal would cost him his job. After sending his younger daughter to meet Takane, the heir and the high school girl start to fall in love. As Takane & Hana, Vol. 7 (Chapters 34 to 39) opens, Takane has been stripped of his wealth and is now penniless. Just another working stiff at his family's company, Takaba Group, Takane now lives in a small apartment that is very low on food. Enter Hana, who visits, usually bringing food. So Takane makes a shocking move, offering Hana a gift that startles her. 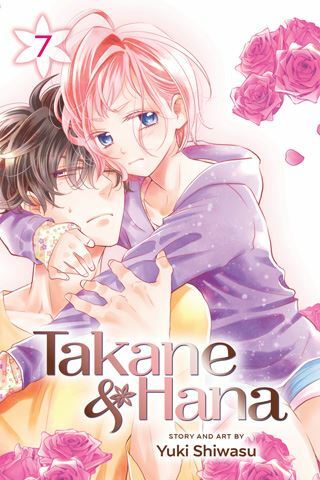 THE LOWDOWN: The Takane & Hana manga is a familiar kind of shojo young romance manga. It is a sweet read, always with a surprise or two. Takane & Hana Graphic Novel Volume 7 deals with the big financial and professional changes that Takane is experiencing. Creator Yuki Shiwasu uses this to move Takane & Hana's relationship forward in big ways, which is a payoff for the series' readers. Ysabet Reinhardt MacFarlane offers sparkling dialogue via her English adaptation, and there are moments when this narrative sparkles quite a bit.